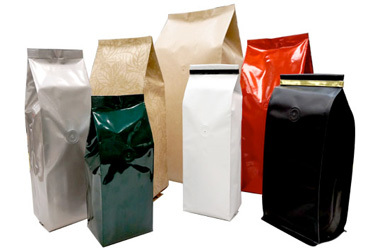 This page has foil side-gusseted bags or pouches made with PET or "mylar", foil and LLDPE or poly. These foil pouches provide an excellent oxygen, moisture and aroma barrier for all products. 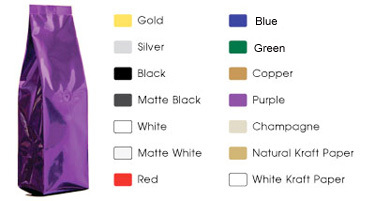 They are available in a variety of colors, with or without degassing valves. Degassing valves are designed to allow the CO2 gases generated by products such as coffee to escape without letting outside air back in. They are designed to keep your product fresh while also serving as a pressure relief system.